*Alisky Phone Holder can be attached to the air vent firmly holding your phones or GPS, thus free your hands and keep you stay focused. *Perfect to achieve Hands-free Calling, Navigation and Loving Music Streaming. This portable car mount is quite compact, which don't take up much space in your car. You can mount the holder at the same time using the air vent. 360 degree adjustability offers you any desired viewing angle. This car phone mount can not only be perfectly used in your car, but also great to be a part of your life. You can also use it as a desk table phone holder to watch news, cook menu, browse social media etc. The mount can extend the width from 52-83mm, suitable for all popular mobiles phones like iPhone X/8/8 Plus/7/7 Plus/6S/6 Plus/6/5S, Samsung Galaxy S8/S7/S6 Edge/S6, LG G6/G5, Nexus etc and also GPS navigator, portable music player. Alisky air vent phone holder enjoys one year warranty and friendly customer service always at your disposal. Welcome to contact us for any questions. Best Father's Day Gift for Dad. 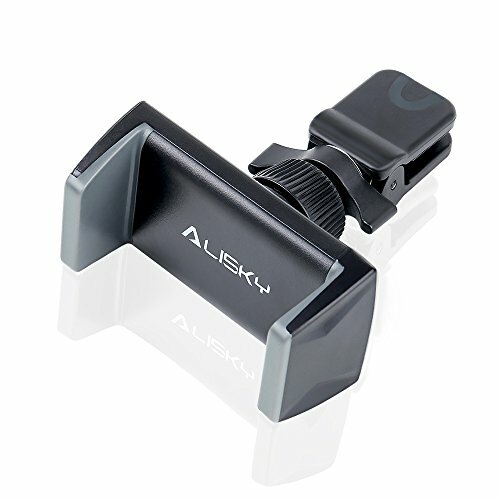 Car Mount Keep Driving Safer: Alisky car phone holder fits easily into most car air vent. Slim and compact design of the vent holder don't block your sight. Freeing your hands from mobile devices (smartphone, GPS and portable music player), distraction-free to keep you driving safer. 360 Degree Rotation: The cell phone mount can be easily adjusted angle for 360 degree, use more conveniently and free your perspective. Mini&Compact: Quite mini and compact design doesn't take up space, never block the field the vision. Universal Compatibility: The mount holder accommodates smartphones, GPS and other portable music players from 3.5-6 inches wide, including iPhone X/8/8 Plus/7/7 Plus/6S/6 Plus/6/5S/SE/5C/5/4S, Samsung Galaxy S8/S7/S6 Edge/S6/S5/S4/S4 Active, LG G6/G5/V20/G3, Nexus 5x, Sony Xperia, Moto, Huawei, Blackberry and HTC cell phones,etc. Anti Slip Anti Scratch: Built in TPU Soft Silicone lining of the phone mount can avoiding scratches of your beloved phone shell and also slip. If you have any questions about this product by Alisky, contact us by completing and submitting the form below. If you are looking for a specif part number, please include it with your message.